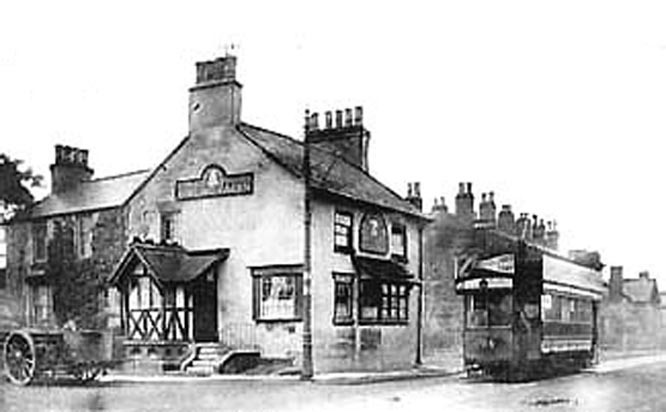 In 1887 Walter H Dutton was a 25 year old bachelor living at 13, Sandstone Road in the West Derby area of Liverpool. He and his 21 year old sister, Amy, his 23 year old brother, Arthur, and his 16 year old brother, Tom were all keen cyclists. Amy, Tom and possibly Arthur lived with Walter, their elder brother. 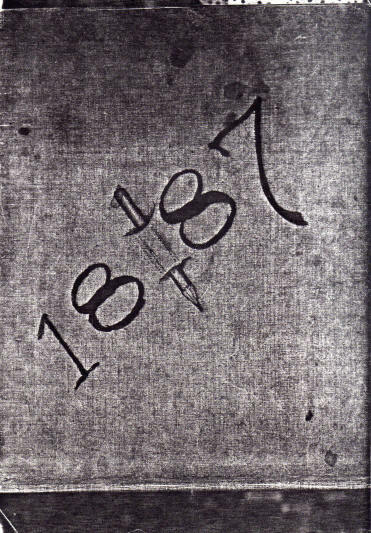 Walt had a certain artistic ability (the 1891 census identifies him as a book-keeper and artist in oil and water colour) and in March 1887, when he acquired a new tricycle tandem and the latest safety bicycle, he decided to keep a sketchbook diary of the cycling activities of himself, family and friends. This section contains all the sketches (well over 200) contained in Walt's 1887 diary. In the 1870s and '80s cycling had grown considerably in popularity. For the first time ordinary people like the Duttons, who probably could not afford to own and stable a horse, let alone a horse and carriage, had the means for quick, independent and comparatively cheap travel. It is evident from the sketches how much they relished the new opportunities cycling offered – to go on exhilarating rides, to tour, compete and just to have fun with friends. Their machines seem primitive by modern standards. 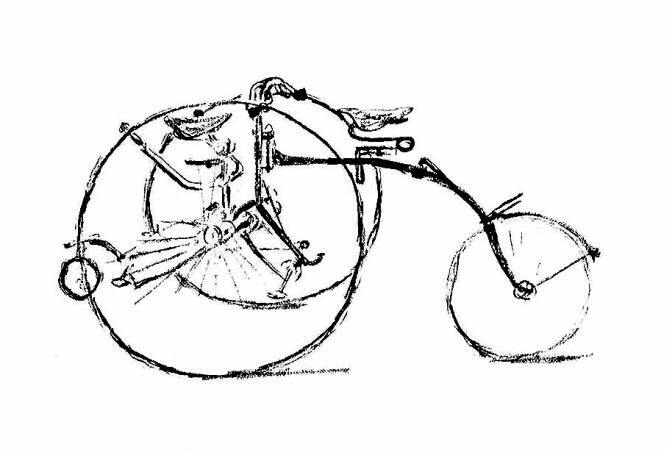 The pneumatic tyre was re-patented the following year (1888) and within 4 years, especially after the development of clincher tyres, had become hugely popular and so sounded the death knell of the penny-farthing. Though the safety bike, which had more or less similar sized wheels, had been developed in 1884/5 and Walt had just acquired a new one (his ‘bicyclette’), at the time of the diary ordinaries (penny-farthings) were still widely used, as were tricycles, which were safer than ordinaries. and which could accommodate the ladies’ long dresses (but see ‘Ye Catastrophe’ on page 19). There are also glimpses in the sketchbook of both single and tandem versions of the bizarre looking Coventry Rotary, an asymmetrically aligned tricycle, and the Duttons most probably owned one since Amy is several times portrayed riding it, though in July she acquires a more conventional trike. The Coventry Rotary, first produced in 1878, was revolutionary in that it was the first cycle of any kind to have a chain, thus paving the way for the development of the safety bike and modern machines. Arthur too had one of the new safety bikes. Amy and Walt often did outings and tours together on their new Traveller tricycle tandem (see sketch below) which several times attracted the curiosity of a crowd. Walt also seems also to have had a single trike since in August he used one for a ‘health tour’, which left him and his companion exhausted (pages 24-25). These sketches with their pithy, hand-written captions and wry humour provide a fascinating and entertaining insight to the cycling world of 120 years ago. There were no helmets and lycra, but tails and bowler hats were sometimes worn. The roads were frequently unmetalled and so were often muddy or dusty or 'loose', and route finding could be a problem. Aggressive dogs were even more a danger then than now, especially to the vulnerable riders of ordinaries, and they were robustly repelled with whip, boot and wheel. 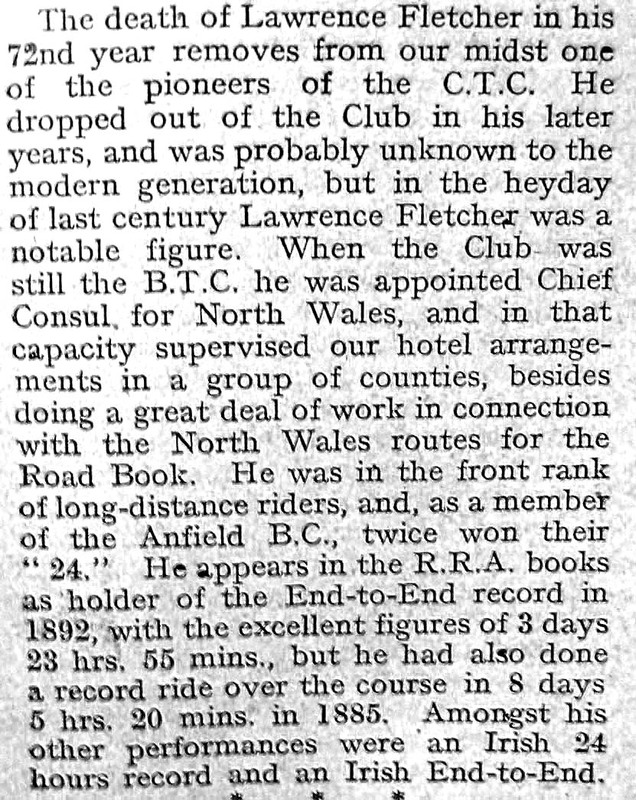 It was a time when cyclists were joining together to form clubs, and in April Walter and his friends inaugurated the Wirral B C, though they also rode on occasion with the Anfield and Liverpool clubs. One of the joys of the sketchbook is a fleeting gallery of incidental characters - the tricyclist who joined up with them and did not believe in going faster than 9 mph, don't cher know, but who was always last at the next refreshment stop, the tramp who asked for tobacco and got it, the kindly carter who offered Walt and Amy a free lift and told them his life story in a short ten minutes, and the posh cyclists they rib from upper crust Bowdon. These and many other fascinating cameos capture the human face of cycling all those years ago. 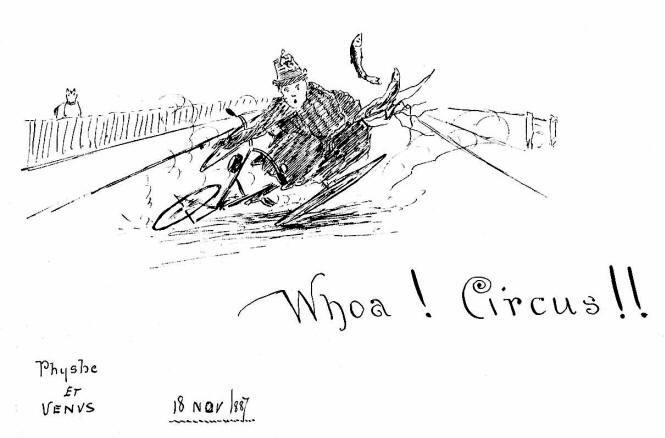 But the overwhelming impression derived from the sketches is of the companionship and sheer joie de vivre Walt and his friends derived from their pastime: convivial visits to pubs and tea rooms, exploring the countryside of Cheshire and Lancashire, doing stunts (‘circuses’) on their machines, coasting downhill ('beats the famed tobogganing') and above all the thrill of racing (‘taking down’) anything else that moved, including a steam train on one occasion (Walt and Amy lost). One sketch of Walt and a fellow Merseysider lazing on a summer's day in the lush countryside of mid-Cheshire after a generous and well-lubricated picnic is captioned 'And are glad we are born', which just about sums up the delight they took in their cycling. It is therefore sad to learn that, just 20 years after the happy days of 1887, Walt was admitted to Lancaster Lunatic Asylum, where he died tragically two years later. In the 1950s Eddie Pearce, a Hoylake butcher and member of the Birkenhead North End Cycling Club, bought the sketchbook from a second hand shop. It remains a mystery how it came to be there, or where it is now. It is possible it remains with the descendants of Eddie Pearce. Our enquiries are inconclusive. However, shortly after acquiring it Eddie Pearce loaned it to an Alan Johnston who took photocopies. For many years he thought little about them until the sketchbook's potential wider interest occurred to him as he unpacked after he had moved to live in Spain. We are very grateful to Alan for contacting us and enabling us to share with you this unique record of the simple pleasures of cycling in a bygone age. 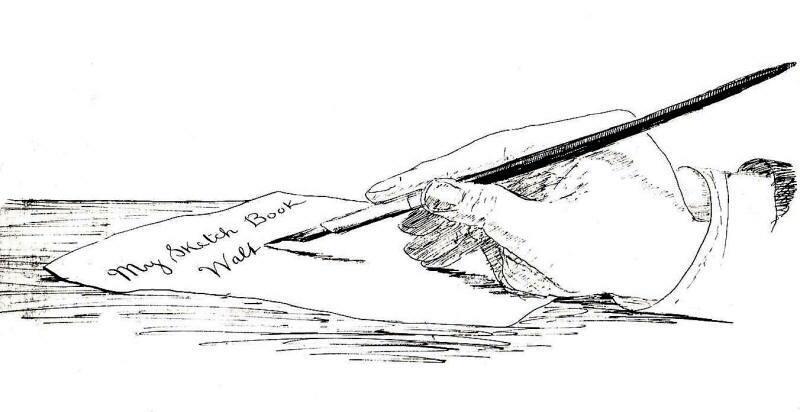 Almost forty names are mentioned in the pages of the sketchbook; we expect these to attract the interest of family history buffs. We would be most interested to hear of any surviving cycling-related accounts or photographs of that time, not least of Walt himself, of whom we know precious little apart from this sublime year in his life. We do know, however, from an entry in the CTC Gazette for September 1939, that his brother Arthur, who figures a lot in the Sketchbook, went on to become a well-known veteran cyclist, as indeed did Lawrence Fletcher, another member of the Duttons' circle of friends and who had been one of the pioneer founders of CTC (see his obituary, June 1933 in the CTC Gazette and a fascinating illustrated article about him written by David Birchall and published in The Boneshaker). A site visitor who is a descendent of Good Old Billy Slade and his son, W J Slade, has provided us some fascinating family history. The Dutton's Traveller tandem tricycle. Despite the appearance of the saddles, the pair of large wheels are at the front, though by 1887 most trikes were steered by a small front-aligned wheel and when this wheel was in a fork they were known as crippers, after Bob Crips, a popular cycling champion.. Here, however, the rider at the back steered while the front rider held on to bars at the side. Both pedalled. Page 4: "Out in the Mud" & "Ditto Dried"
Page 31: Safety Cycles over "Things"